Edu was the guide for my friend and I. His English was very good, and he displayed a lot of knowledge about this wonderful site. He made the tour fun and interesting even though the weather was wet and chilly! I would recommend this private tour again. Excellent - we had a great time with our guide and he was patient as my two kids made friends with the cats and frogs we found on the tour. His English was excellent and the private nature of the tour allowed us to ask lots of questions and see things that the other tours went right by. We were also able to customize it to focus on the special architecture of the area since the tour was not long enough to see everything it's HUGE. A wonderful day and I highly recommend this way of seeing the Alhambra. We bought a private tour as all other tickets were unavailable. Never was money better spent! Our young Spanish guide was full of enthusiasm and knowledge. He provided a historical background, full explanations of the cratfsmanship and buildings but more importantly for me he told us about the Nazrid culture recreating a picture of how they were living and ruling in their time. There was less to know after they left as the Alhambra was never lived in again. The tour did not allow enough time to see all the areas of the palace and gardens and we are determined to make a return visit .We had been uncertain as to whether we could take a rucksack with water and biscuits into the palaces but on arrival discovered that this was permissible. Had we done this we could have revived ourselves at the end of our tour and then spent more time in the General-Life before leaving for refreshments. This tour was without a doubt the highlight of our two week vacation in Spain. Our guide, Blanca, went way beyond our wildest expectations with not only her vast knowledge of the Alhambra but also with her congeniality, patience and eagerness to answer all our questions. We appreciated the leisurely pace we were afforded with a private guide versus the herding of large tour groups that we witnessed. This is one location where a private guide is essential. We cannot recommend this tour highly enough. Thank you Blanca for a wonderful tour. The Alhambra tour was a beautiful and educational experience. We could have enjoyed the architecture and sights by ourselves, but our tour guide, Igone Arrieta Gomez, made it into an educational event. Igone is a native of Northern Spain, but her English is perfect she is ideal for American or UK tourists. The day of our tour was cold and rainy, but we still enjoyed our 3.5h walk around the Alhambra and the gardens of Generalife. Be sure to wear VERY good shoes that have non-skid soles, since you'll be walking on cobblestone surfaces. If it's cold wear your warmest clothing even if it's heavy. Don't forget a hat. The walk from the Alhambra down to the Plaza Nueva in Granada was all downhill, but very nice and we recommend it. To go from the city Gran Via de Colon up to Alhambra I recommend taking a taxi so that you have the energy to walk all over the Alhambra. This is a tour which I will never regret. Thank you Viator and especially thanks to Igone. Antonio Nono with NHUE was the perfect tour guide for our Alhambra and Granada visit. Very knowledgeable and entertaining - he kept the interest of 3 teenagers, who still say it was the highlight of our travels. This private guided tour was worth every penny. Thank you! 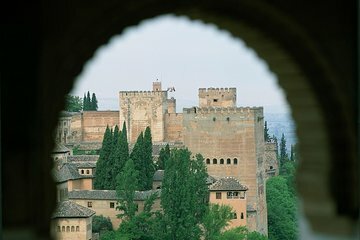 Visiting the Alhambra and Generalife was the highlight of our trip to Spain. Our tour guide, Jaime, was the best. He was very knowledgeable and enthusiastic. He clearly loves history and sharing his knowledge with others. He pointed out many things we would have missed on our own or with a larger tour group. His storytelling helped illustrate what life must have been like during that time. Highly recommend Jaime. This was a wonderful way to see the Alhambra! There were 4 people in our group which worked well for making our way through the busy areas. Meeting up was smooth and we had a break part way through our tour. Our guide was very knowledgeable and pointed out things we would have missed in a large group tour or walking through on our own. Highly recommend this company.